Vaccinium pallidum Ait. – Dryland Blueberry (images); syn. V. vacillans Torr. 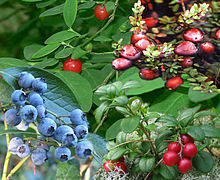 Vaccinium membranaceum – Square-twig Blueberry, Thinleaf Huckleberry, Tall Huckleberry, Big Huckleberry, Mountain Huckleberry, "black huckleberry"
↑ "Vaccinium Linnaeus". Index Nominum Genericorum. International Association for Plant Taxonomy. 2003-02-05. สืบค้นเมื่อ 2008-05-09. หน้านี้แก้ไขล่าสุดเมื่อวันที่ 21 กรกฎาคม 2557 เวลา 22:34 น.